Phil O'Donnell was laid to rest in Hamilton on Friday. The hundreds of Motherwell fans who waited outside St Mary's in Hamilton applauded as the cortege left for the internment. Fans began to gather an hour ahead of the noon service and they were able to see the church fill to overflowing when family and friends were joined by many well known faces from the football world. The current team was joined by many of the 1991 cup winning team and by many former players.Representatives from other SPL teams were there in numbers and many local and national politicians were present. 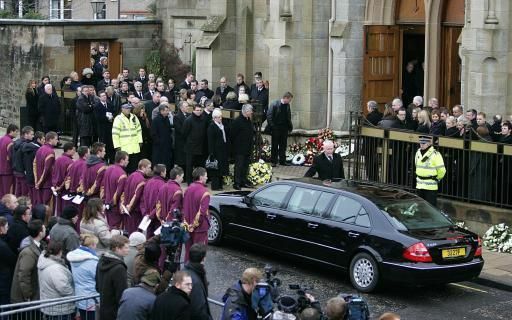 The service was relayed to the crowd outside through an audio link.A number of official funeral attendees including Lee McCulloch, David Weir and Tommy Coyne (among many others) had to stand in the bitter cold as the church lacked capacity for all of the mourners. For fans, the most touching part of the service were words spoken by Chris McCart.He did well to keep his comments light hearted given the circumstances and retold a good story about Phil sprinkling holy water on himself before the 2005 Cup Final.Scott Leitch joined this ritual but was moved to ask, after 75 minutes with Motherwell 5-1 down, when it would start to work! After a requiem lasting around 90 minutes the family, clearly in grief, came out to the waiting cars.Phil received a final cheer from the crowd as he set off on his final journey. This was an emotional day for all concerned with Motherwell but it is now time to step back and give the family space.There will no doubt be a suitable memorial announced by the club at an appropriate time but until then we need to focus on supporting the management and players and get back to business.